An amazing Flickr album of Apple.com homepage screenshots by Florian Innocente (via Daring Fireball) takes us down the memory lane, all the way back to 1996. 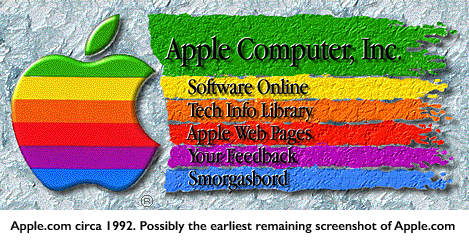 And to go back even further to 1992 or at the very birth of the World-Wide Web, Kevin Fox has shared a snapshot of how Apple.com appeared at that time (shown above). “I’m a digital pack-rat, and I’ve been on the Internet a long time. I remember a very different, more playful Apple.com homepage. I remembered a page that was more Fractal Design Painter and less grids and columns. I remember taking a screenshot of that page because I liked the look of it. But where would it be today? But the Flickr album, well its truly a mind blowing collection of Apple website images. It even contains a funny screenshot from 1997 when Apple.com was hacked with an image on the homepage that says “Take a look at the future of Mac OS”. Hit up this link to access the complete Flickr album and tell us what you think.